GNOME 3.30 is now available in Gentoo Linux testing branch. Starting with this release, GNOME on Gentoo once again works with OpenRC, in addition to the usual systemd option. This is achieved through the elogind project, a standalone logind implementation based on systemd code, which is currently maintained by a fellow Gentoo user. 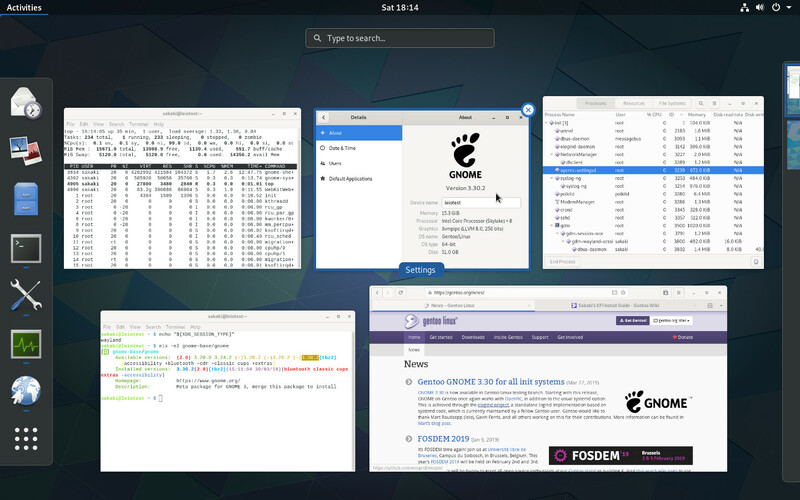 It provides the missing logind interfaces currently required by GNOME without booting with systemd. For easier GNOME install, the desktop/gnome profiles now set up default USE flags with elogind for OpenRC systems, while the desktop/gnome/systemd profiles continue to do that for systemd systems. Both have been updated to provide a better initial GNOME install experience. After profile selection, a full install should be simply a matter of `emerge gnome` for testing branch users. Don't forget to adapt your system to any changed USE flags on previously installed packages too. If you did not use elogind before, you may need to restart, or at least re-login any open sessions. sys-auth/consolekit should not be used with GNOME. GNOME 3.32 is expected to be made available in testing branch soon as well, followed by introducing all this for stable branch users. This is hoped to complete within 6-8 weeks. If you encounter issues, don't hesitate to file bug reports or, if necessary, contact me via e-mail or IRC. You can also discuss here in this thread. I'd like to thank Gavin Ferris, for kindly agreeing to sponsor my work on the above (upgrading GNOME on Gentoo from 3.26 to 3.30 and introducing Gentoo GNOME elogind support); and dantrell, for his pioneering overlay work integrating GNOME 3 with OpenRC on Gentoo, and also the GNOME and elogind projects. Posted: Wed Mar 27, 2019 11:37 pm Post subject: Thank you! Whoo! Thank you, leio! I use GNOME 3 on two laptops currently, so this is very nice news! Very cool, trying to install it now. But I always get stuck in something trying to install vala:0.44?! emerge: there are no ebuilds to satisfy "dev-lang/vala:0.44". Do you have any overlays added that may mess with your dependencies? Vala is ~amd64 beginning from 0.40. The gnome ebuilds use vala_depend() to generate a dependency list for different vala versions - seemingly up to 0.44. Instead of telling me to unmask 0.40 or 0.42 portage tries to install the nonexistent 0.44 and quits. While I realize it's unsupported software, is there a migration path for the dantrell overlay users? Not necessarily a step-by-step guide, but just general advice? This is something I will document on my end after I review it but if you can't wait it's probably as easy as following the Uninstallation instructions in the project documentation while (1) skipping the unmerge of gnome/gnome-light and (2) selecting Gentoo's desktop/gnome profile when switching profiles. One significant difference right now is, I believe, that the main tree work is in testing branch (~arch) for the time being, while dantrell has the selected GNOME version packages marked stable in his overlays. So if you are not a testing branch user, things are a bit more complicated to switch, as you'd need an extensive package.accept_keywords file to get elogind GNOME supporting packages visible from main tree on a stable system. I don't have a ready package.accept_keywords snippet to provide to help with this, however this will be solved on its own once we can stabilize this in (hopefully) 6-8 weeks. So one option for stable users is to just wait it out. I don't really mind living on unstable for some stuff, but the amount of packages needed for gnome can be daunting. So I think I'll wait for now. Anyway, I can't really thank dantrell enough for his superb work, and I'm glad Gentoo finally caught up on Gnome version, and supporting OpenRC at it. Thanks a lot for your work, and everyone involved. Thank you for your hard work! I'm so glad Gentoo now has a complete GNOME without systemd. I probably won't stop being amazed of what the Gentoo team is able to achieve. Thank you quite a lot - although I probably won't use it, I have a feeling that open source developers receive too few "thank you"s per month. This is a good situation to contribute to that amount. Glad to hear, thank you. Will likely wait for stable before giving it a shot but appreciated. Fantastic work leio, many thanks! A screenshot of the resulting system be viewed here. The only (relatively minor) issue I encountered was when trying to turn on the "share" USE flag on gnome-base/gnome-extra-apps; this in turn tried to pull in sys-apps/systemd via unconditional RDEPEND from gnome-extra/gnome-user-share-3.28.0, so I just left it unset in the end, per the defaults. Pretty sure this USE flag can be set on dantrell's version though. Thanks again to you, and of course to dantrell, for making this happen. The problem with gnome-user-share is that yes, it can be made to compile without systemd quite easily, but using it is another matter. gnome-control-center/gnome-settings-daemon launches it via systemd API when file sharing is enabled in the Sharing settings panel. So this needs work to actually be seamless - I doubt many people will know to launch /usr/libexec/gnome-user-share-webdav manually to have it work; and at that point one could use some different solution to this, that'd work automatically without systemd. That said, I think the autostart rules do work with openrc, so at least after a re-login it gets honored. But then there are concerns that it won't stop when sharing is disabled, which is questionable security. So for now I juggled things around to not build this by default on gnome profile, shifting that default to systemd-only. I almost removed it completely (from the metas), and almost default disabled on systemd too, as I'm not sure many people really use this on Gentoo at all - but left the status quo for systemd for the time being, to revisit this all with 3.32, which has a new gnome-user-share release as well. Anyone else seeing this too? So far only Steam seems to be affected, but I couldnt figure out whats going on. I already tried re-merging dconf and glib, which didnt help. Both packages involved (dconf+glib) were updated during the gnome merge. Yeah, I am. Can't open friends tab on Steam. You might downgrade to 2.56.4 and see if it works then. 2.58.3 just got stabilized, so might have problems. Looks like someone jumped the gun on stabilizing glib. glib-2.58 was stabilized on purpose to get TLS 1.3 working again by bringing glib-networking to 2.58 as well (they should be in sync). That gets some RSS and e-mails to work again in gtk apps that got broken due to gnutls stable upgrade. I know of no issues with dconf, or structured logging, or any changes in these versions at all with these updates, and haven't seen any bug reports to that effect. Perhaps someone file a bug, so it can be tracked and investigated in a suitable location. I don't have this problem at work. I was able to launch and use Steam with no issues. Using essentially the same system (dantrell-gnome 3.30). Hardware is different I'm very tentative to say this is not a hardware setup difference issue. I really dont know what happened, but all this steam library madness is really annoying. fixes it (it deletes the steam installation, config, etc., but keeps installed games).